Fall has officially arrived and one of my favorite things to do is, to layer different textures and prints. P.S. I apologize I have been slacking on writing all of you dolls back lately but I promise I will catch up on it all. Did I mention.. 14 days until my birthday. Is it too early to start the countdown? If you have time please VOTE FOR ME. 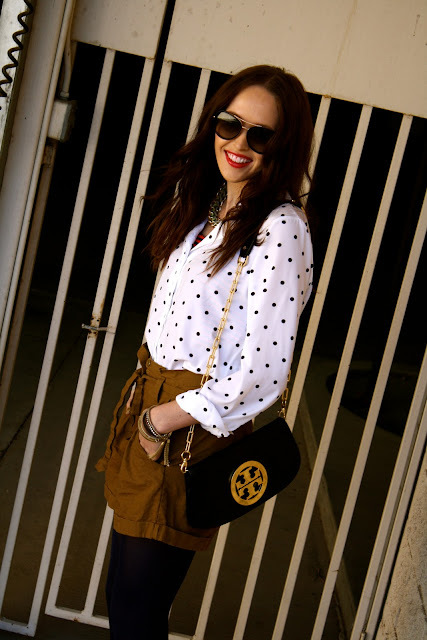 Love your Tory bag and I looove polka dots everything so adorable and happy that we are able to layer slowly this time of they year. Dying for your baG. love the shorts and the tights!!! Ah this is so cute. I particularly like the tights and heels. Great look!